I suffered physical and sexual abuse for four years from the age of about eight until I was 12 years old. My abuser held this power over me, I was scared and didn’t understand fully what was happening. Someone I trusted was using this trust to abuse me. The abuse, some weeks, would occur everyday and make me feel sick and dirty. First thing I would always do is run straight to the shower and sit in there and cry. I was ashamed. I felt if I spoke up my abuser would hurt me and my family. I also questioned to myself whether anyone would believe me – a young child’s word against this grown man. I also felt I would be judged by others and that, for some reason, people would have a bad opinion of me. However, when I finally found the courage to stand up to my abuser and speak up none of this was true. Yes, at first it was hard, but the relief was so great, the abuse would finally stop, I no longer had to suffer in silence. 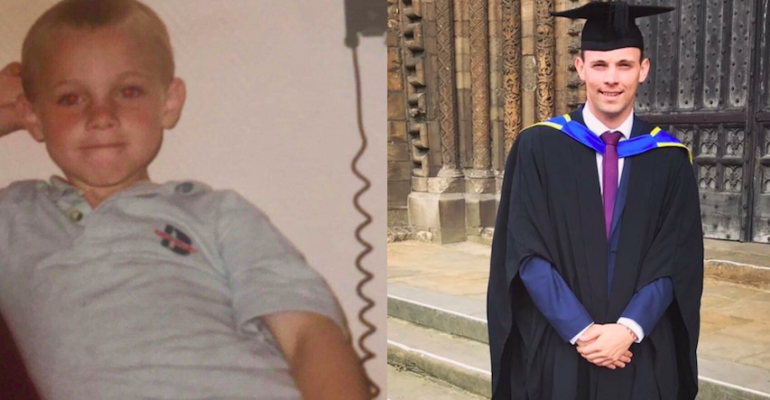 Since I took a stand against my abuser my life has gone from strength to strength, I graduated University with a law degree, I’ve travelled and worked in America, I’m studying for a master’s in international law and, most of all, I’ve made so many great friends who have been with me through my journey and supported me. The help and support out there from charities such as Embrace means that you can rebuild your life in a positive way. Yes, my abuse will always be a part of my life, but you can’t let it define who you are. I’ve taken what’s happened to me as a child and tried to use it to make a difference, to ensure no child suffers what I have and – if they do – they know that they can stand up and speak out and there will always be people there to help and support you.